Nylon (P) Conduit is used for wire & cable protection and organization . Nylon (P) Conduit is known as split loom, convoluted tubing, corrugated tubing, ribbed tubing and flex tubing. 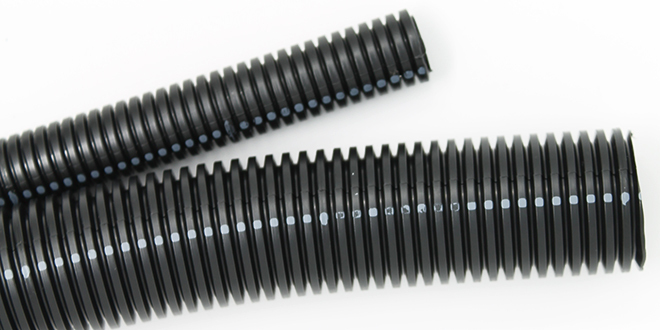 Nylon (P) Conduit is black with a grey stripe and available slit or non slit. Nylon (P) Conduit provides protection from friction vibration and puncture. Nylon (P) Conduit offers excellent Abrasion assistance. Nylon (P) Conduit protects against automotive fluids, and weather, water, snow, salt, ice, heat cold and sunlight.